Which kind of ceremony could I organize? Many of the ceremonies that open the Ibiza weddings are far from traditional. And is that if you decide to get married in Ibiza what you are looking for is precisely a celebration that leaves the pile. Ask where and how you want it to be and who you would like it to officiate and little by little you will be giving shape to one of the most important moments of your wedding. To help you give you some clues as to which are the most popular options, the most feasible and even which to discard to avoid unpleasant surprises. Official or fictitious ceremony? 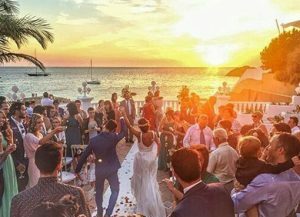 A very widespread option among our clients is to celebrate before the trip to Ibiza a civil or religious ceremony in their city (which saves the transfer of files and carry out paperwork in a city that Is not yours) and hire on the island an officiant who will hold a ‘not legal’ wedding but, yes, tailored to the couple. If you decide for an official civil ceremony you should know that there are municipalities in which the councilors do move to the place of the ceremony and others in which they do not; Therefore, it is an issue that you should keep in mind when it comes to booking a restaurant or renting a house so that you do not take the surprise. If instead you are clear that only you are looking for a symbolic ceremony you will find more facilities since they will go wherever you want. There are many officiants on the island who will do a good job adapting to your requests, either in the form of a more traditional ceremony, more comical or even with that mystical touch that is so much on Ibiza. Another aspect that we think is convenient to clarify is the celebrations on the beaches. Many couples arrive with the idea of ​​giving themselves the ‘yes I want’ to the seashore. The problem is that such a romantic desire is not allowed and there are weddings that end up being paralyzed with the consequent disappointment of the couple, who will also have to pay a fine. The beaches, as you know, are for public use and to be able to hold a private celebration would require a Coastal Demarcation permit, if it is granted. Therefore, if you want to hold a ceremony near the sea with guests and a minimum of furniture we advise you to choose to book in a restaurant located on the beach and avoid risks. We hope to clarify some of your doubts and, in any case, you already know that we are here to help you. Do not hesitate to contact us!